1. A wide range of values is evident in my piece where the fabric folds and the light hits. I believe the folds are pretty dark in contrast to the highlighted parts and the shadows fade very smoothly. 2. I struggled a lot with the practice fabric drawings. I had to do them about 3 times until I started to actually capture the illusion of hanging fabric with shadows and highlights. My final piece was the first piece I was happy with out of the 4 that I had done. 3. 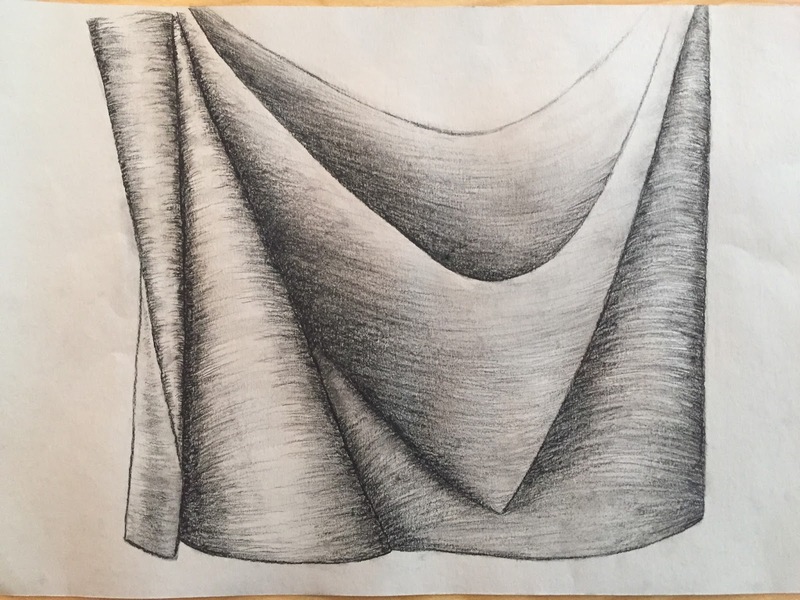 I used a charcoal pencil to darken the edges of the fabric where it folds to create shadows and once I finished shading I didn't even need to use a white colored pencil to highlight because I had shaded those parts so lightly. I started out with more pressure along the edges and then used less pressure as I worked towards the middle. Personally, I find it easier to not use a lot of pressure on any of the piece but to layer the charcoal as I expand out so the edges become darker through layering. 4. Without the correct texture someone could interpret your object as something completely different! Texture is key to taking the final step in bringing your object to life and creating a realistic look. 5. If I were to do this piece over again I would practice shading more (since I understand it now) and master how to read the object and it's shadows better. Basically, I would do what I did but with more practice and more understanding of where to shade.